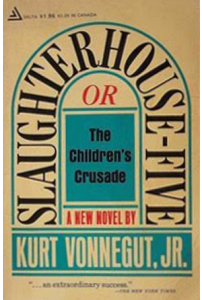 Slaughterhouse-Five is a novel by Kurt Vonnegut Jr., published by Delacorte Press in 1969. Kurt Vonnegut Jr. began writing about his experiences in World War II and Dresden in particular immediately after the war ended in 1945. He autobiographically details the difficulty of trying to write the “famous Dresden book” in the first chapter of Slaughterhouse-Five. By 1965 Vonnegut had written five novels of increasing popularity, but none of them concerned Dresden. Between 1965 and 1967 he lived in Iowa City teaching at a writer’s workshop; the writers there encouraged Vonnegut to insert himself into his fiction and he was finally able to begin the book in earnest. In April, 1967 Vonnegut was awarded the Guggenheim Fellowship to travel to Dresden to continue researching the novel. On March 31st, 1969, Delacorte Press published the 186-page novel for $5.95 in a print run of 10,000 copies. 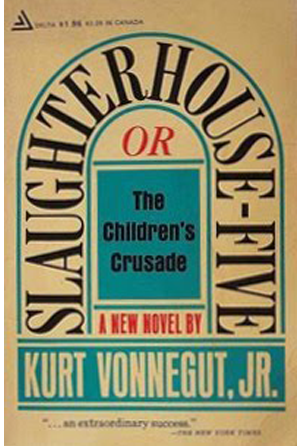 Slaughterhouse-Five was immediately successful upon release; it was also chosen as a Book Club selection and numerous additional printings followed throughout the year.